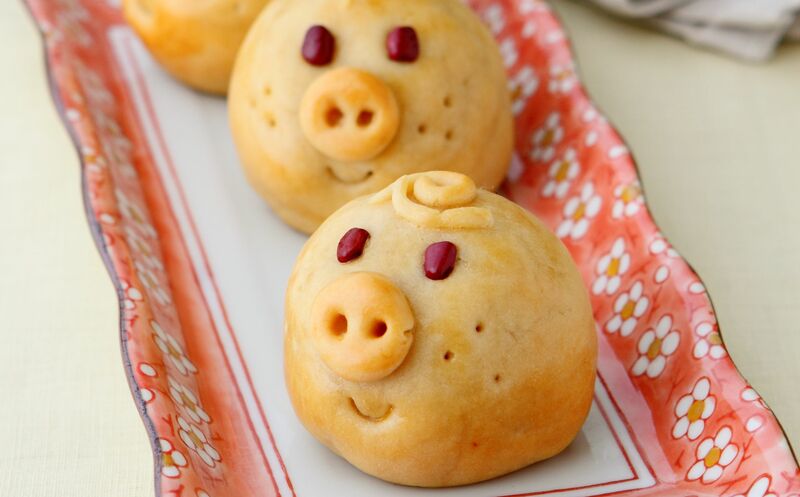 Parents and children alike will find these piggy mooncake biscuits an adorable gift. The honeydew lotus paste in the centre is a sweet and fruity surprise for those looking for a new flavour. In a bowl, combine golden syrup, palm oil and alkaline water. Cover with cling film and rest for 1 hour. Sift flour over and mix into a dough. Cover with cling film and rest for 1 hour. Divide into 50g portions. Combine ingredients and mix well. Divide into 40g portions. Press each dough ball into a circle. Place the filling in the centre and wrap dough around it. Shape into balls. Make a tiny ball of dough, brush with egg wash and stick it into the centre of the ball to form the snout. Press to flatten slightly and poke 2 holes for the nostrils. Form eyes with the red beans. Form the tail from dough and stick on with water. Form a line for the mouth. Brush with egg wash.
Pre-heat oven at 170ºC. Bake on a greased tray for 15 to 18 minutes.